It's been over 4 years since the release of the 5D Mark III, and Canon has finally released something to compete with Nikon... hopefully. I considered jumping ship like so many have in the past year, but I only bump into issues with a small amount of photos I take. So I spent the weekend taking photos with the sole purpose of doing things that were impossible with previous versions. Noise generated at higher ISOs is a very subjective thing and I fall into the camp of preferring some grain over motion-blur. With the Mark III, I was fine with anything up to 3200 and depending on the scenario would push things up to 6400. This is where things started to fall apart for me with this weird redness that would start appearing mostly in the shadows and corners. There has definitely been a huge improvement in the grain and the redness issues. I think everyone will be comfortable with at 1-2 stop jump in their ISO preference. I'm really fine with 6400 and 12,800 on the Mark IV. The red grain with lines that would appear straight out of camera seems to no longer be an issue. I even bumped some photos +1 or 2 stops at ISO 12,800 in post and it didn't appear. Here's an example with no noise correction. "I don't care about what anything was DESIGNED to do, I care about what it CAN do." Dynamic range is all about being about to push things in post to get the camera to do things it wasn't designed for. There is a definite improvement over the Mark III with underexposing to preserve the highlights, then boosting the shadows in post. You still can't take a silhouette and bring it back, but if you can expose with some details still showing in the shadows it works. When you go too far, skin starts to get really weird and alien looking. If you used the Mark III a lot, you instantly notice how much faster the Mark IV is. Even focusing with the 85mm f/1.2 is better. It quickly goes into focus and locks on accurately. I would yell in my head for my camera to focus. Most people should see a decrease in the number of shots missed due to focusing issues. It's sort of amazing how normally I would take 3 or 4 shots just to ensure it was in focus and now I end up with 3-4 shots that are all in focus. I often use Live View in tricky situations or for portraits because you can see exactly what you are going to get. You can touch to focus or use face tracking. It's just as fast as using the view finder which is incredible. Canon also made the photo taking faster in live view so you don't have to wait for the mirror. You can hold the half press of the shutter button and it will immediately let you take another photo and won't give you the image review. So many times I would miss a moment cause I would take a shot and then something would happen and I would be waiting for it to respond. Everything is getting a touch screen now but I think this will prove useful. You can easily change settings on a lot of screens which may or may not end up your preferred method. Pinch to zoom could become your quick way to check focus though instead of zooming with the scroll wheel and then using the thumb stick to move around. I always wondered why this wasn't added, since it's a simple software addition. You can now take time lapses without having to hook up to a computer or buy a $100 dongle-thing. I use Av mode most of the time and by default the minimum shutter speed will be based off the lenses focal length. The problem is that this is typically way to low for most humans that aren't concentrating to prevent camera shake. In the Mark III, you can set the minimum shutter speed to a fixed number, which I did. In the Mark IV you can now set it to Auto, but tell it to be faster in increments based off the lens. This means I can let it drop lower than 1/250 for wide angle lenses and it will go higher for telephoto. This will try to make your whites white instead of keeping the yellow hue of tungsten. It's not the magical solution I initial thought it could be, but it seems to get it better with mixed lighting or with tungsten lights. It did often go too far and make it too blue, for instance with light yellow walls. 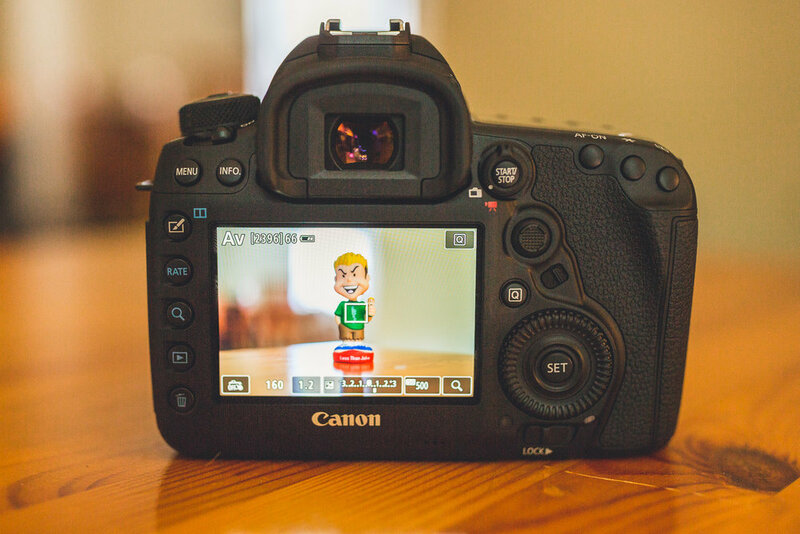 You can turn on certain settings, including most from the top LCD, to appear in the viewfinder. This is transparent on the actually screen, not along the bottom in green. You can also add an electronic level to help keep your horizons straight. Low battery will start blinking here which is much more noticeable than on the bottom of the screen. This has been in other cameras for awhile now, but it works. I've used this on the 6D and it's similar, but it doesn't seem as janky or slow to connect. It will sync the time with the GPS, which if you shoot with multiple cameras, could be extremely useful not having to worry about syncing cameras. There is a noticeable improvement to the buffering when shooting raw onto two cards. I would hit it occasionally during a long precessional or shooting a panoramic. The solution to this was to shoot SRAW, JPEG, or to only use one card. This is a fringe case but I'm glad they addressed it and buying the faster cards is no longer a waste. Useless. This lets you adjust the focus AFTER you take the photo using Canon software. First the files are 2-3x bigger to enable this and second the adjustment is so fine it doesn't make that much of a difference. For example, If one eye is slightly out of focus, it still will be out of focus after adjusting to the max. When it's dark, it's really difficult to see the black focus points. Would be nice to turn on AF point illumination all the time. The setting in the menu just forces it to blink on focus. Handy for shooting really low or high, but I'm guessing this was a durability decision. As someone that is pretty rough with the equipment, I'm sure I would break this relatively quickly. It feels more plastic-y than the Mark III. While this could simply be the paint finish they chose, or the reduced weight. It feels like the 35mm Mark II lens compared to the older L lenses. The ergonomics are exactly the same as the MkIII. If you were like me and struggled knowing Nikon was far ahead in the sensor and auto focus game, this brings Canon into the race, but definitely not ahead. I was concerned that this would be a minor upgrade to the Mark III, but I've been pleasantly surprised. Canon has made improvements where they needed it and added many tiny features that make things easier. If you had no problems with your Mark III, I don't think upgrading is a necessity. Day light portrait photographers and studio photographers will probably not justify the $3499 USD price tag to get it. Looking to the future, Canon will have to release something much sooner than 4 years or they leave the door open for Nikon to pull away again. Knowing the future is mirrorless and electronic view finders, the live view performance gives Canon a hope to be a player in that game. It feels better than what Sony and Fuji currently offer who are leaders in that game. Have any questions? Comment below and I'll do my best to answer them.